Welcome to Deer Creek - our brand new riverfront cabin! It is located in the gated Coosawattee River Resort. It sits on Mountaintown Creek, a stocked trout stream that feeds into the Coosawattee River. The amenities of the community include 2 outdoor pools and 1 indoor heated pool in the Rec Center. The Rec Center also includes tennis, basketball, miniture golf, a workout room and a game room. There is also a fishing pond, several picnic areas, and tubing available from the Coosawattee Tubing Company-seasonal. The main floor of the cabin includes a huge open area with vaulted ceilings and large beautiful windows overlooking the creek. The family room has a gas-log fireplace, instant fire at the flip of a switch, along with a large flat screen TV, Satellite, Blu-ray DVD player and free Wifi. Dine on a custom handmade farm table that seats 6, plus 4 additional barstools. The kitchen is nicely upgraded with granite countertops, new stainless steel appliances, plenty of cabinet space and new kitchenware to enjoy a great meal after spending the day on the river. There's also a 1/2 bath and a laundry room with HE washer/dryer. The main floor also has a huge wrap around porch with adirondack chairs, Just outside the main area is a comfortable outdoor seating area with a stacked-stone wood-burning fireplace. We offer a gas grill for cookouts with the family,. There is also a screened porch with table and 6 chairs for additional dining and entertainment. The master bedroom is also on the main floor. It has a king-size bed, brand new comfy mattress, all new pillows and linens, and a large vaulted ceiling. The master bath offers a granite double vanity, a large walk-in shower, and plenty of closet space. Just upstairs from the main level is a large open loft. It has a desk, futon couch that converts to a full-size bed, a large closet and a full bathroom with walk-in shower. The kids love the loft with the large flat screen TV, with satellite, Blu-ray player, and X-Box and games provided. There are 2 guest bedrooms downstairs in the terrace level, open to the main floor. This floor has a pool table, foosball table, bar with mini-fridge, and another gas-log fireplace. There's a comfy couch with recliners, and a large flat screen TV with Satellite and Blu-ray player, and a pub table with 4 chairs. One of the bedrooms has another king-size bed, with private access to the full bathroom with shower/tub. The other bedroom has a Queen-size bed and shared access to the same bathroom. This level also has a large porch with adirondack chairs/love seat. But best of all there is a brand new 6-person Sundance jacuzzi hot-tub, a perfect way to wind down on a cool evening. On the walk down to the creek there is a nice fire pit area for an evening campfire, perfect for roasting marshmellows. We include tubes and some fishing gear to get started. There's so much to do at Deer Creek. Downtown Ellijay is 15 minutes away, and Blue Ridge is only about 1/2 hour. We really enjoy the quaint antique shops in Ellijay and some great locally owned restaurants. Just south of Ellijay is Carter's Lake and Amicalola Falls. There are also several vineyards in the area to tour. You can rent a boat at the marinas at Carter's Lake or Lake Blue Ridge. Horseback riding, whitewater rafting, hiking and mountain biking are also available nearby. We really enjoyed building and designing our new cabin. We hope you visit Deer Creek and fall in love with it as we have! Our family has frequently visited Ellijay and the Coosawattee River Resort for the past 10-12 years. We purchased a lot on Mountaintown Creek years ago and dreamed of building there one day. 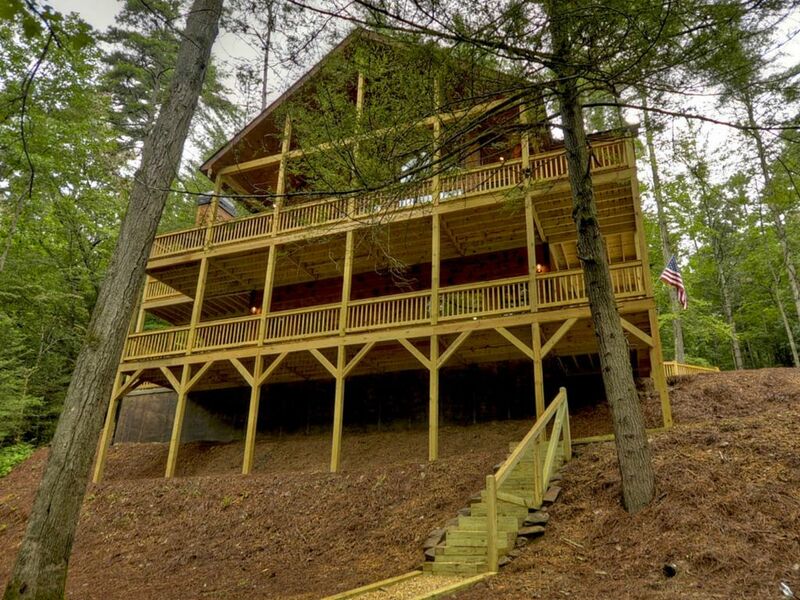 The cabin was just completed in Summer of 2016, so it has not been rented before, and it is in immaculate condition. We love to fish, tube the river, go for walks, and sit on the porch. We hope you enjoy it as much as we do! Beautiful home situated in a beautiful setting! Home is spacious and cozy. Loved all the fireplaces and the hot tub. River was great place for fishing. Rec center was under construction so didn't get to use it much and it takes about 20 minutes to drive there. Stephanie was always prompt getting back with me to answer any questions or offer recommendations. Enjoyed the many surrounding activities in the area, some really great restaurants too! Beautiful cabin, well stocked with what you need, plenty of space, the outdoor fireplace is lovely. Close to everything you need, shopping, restaurants, yet secluded enough to feel like you’re really getting away. This has been our 3rd stay at this awesome cabin!It really is just the perfect place. This year, we made sure to plan our days so we could spend more time enjoying the cabin. We loved spending our nights in the hot tub and talking by the fire. The kids were finally old enough to fish and we even managed to catch! Only a short drive into town and close to local grocery stores. Of course, the reason we return year after year (as my son would see it) Bodie, the neighbors dog, he is always the highlight of the kids trip. He would take morning walks with us along the river and spent a few nights with us at the fire :) what's a sweetie! Thanks Justine for writing a five star review. We would love to have y’all back next year. I’m so glad you got to relax and enjoy our cabin. My family just spent a great weekend at your beautiful cabin. We have stayed in lots of cabins through the years and this is one of the very best ones of all. It is very spacious,which we liked, very well designed and appointed, very clean and comfortable---had everything we needed. We had lots of fun in the game room with lots of competitive play. We also enjoyed the outdoor fireplace Saturday afternoon even though it was very cold---roasted hot dogs over the fire. The setting with the view of the river is unsurpassed. Needless to say ,our stay was memorable and very enjoyable. Hope we can come again sometimes. Thanks so much for sharing it with us. Thanks so much for the 5 star review! I tried to think of everything that we enjoyed when we rent cabins and wanted it to feel like home. I think one of the best features is the fireplace on the back patio area along with the fire pit by the river. I’m so glad you enjoyed your stay! The house was absolutely beautiful! All the amenities of home. We really enjoyed our weekend! The house was beautiful and all new! We relaxed with no worries for the weekend. Enjoyed the hot tub , outdoor grilling and the laundry amenities as well. We would love to come back in the spring/summer to take advantage of the area more! Thanks Paulette for the 5 star review. I’m so glad you enjoyed your stay. You are welcome to come back in the summer and take advantage of tubing and fishing in the river. We loved our stay at this beautiful cabin! It was clean and the perfect choice for our family. The owner was very responsive throughout our stay. We would love to come back! Thanks Rebekah for writing a 5 star review. Please think of Deer Creek again if you decide to come back to Ellijay.